Whenever the Franklin Rebels and the Brentwood Bruins suit up for a football game, it’s a big deal. This isn’t just Southern high school football; it’s close to being a religion. The Nashville, Tennessee rivals always draw a crowd, and that was no different as both teams began their 2018 seasons at the end of August. Close to 7,000 people gathered on that warm summer night to witness something special – a ritual, of sorts, that kicked off another academic year. Gabriel Evans coaches offensive line for Brentwood. He understands the value of hard work, a team-oriented approach, and solid preparation, to say nothing of execution. As someone who also teaches AP/Honors classes as well, he knows a little something about the value of organization in the pursuit of a job well done. That’s true on the gridiron, in the classroom, and even in the equipment storage room. Evans, you see, has a third title: equipment manager. 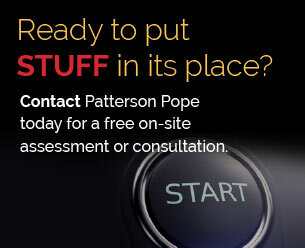 As such, finding the right athletic storage solution for an aging set-up was part of his assignment, as well. 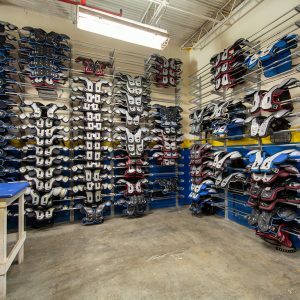 See how proper football equipment storage can boost school pride. That inaugural game this season went to Brentwood, 17-14, thanks to 10 unanswered points late in the game. It was a good way to start the season! On any playing field – sports or not – keeping score is essential; it’s how you measure yourself against the competition. In his role as equipment manager, Evans wants all of Brentwood’s football players to look at themselves with pride at all times. Taking pride in their surroundings is a part of that. When you combine the number of kids from the varsity, junior varsity and the freshman teams, the total can be anywhere from 120 to 150 individuals. That’s a lot of pride! 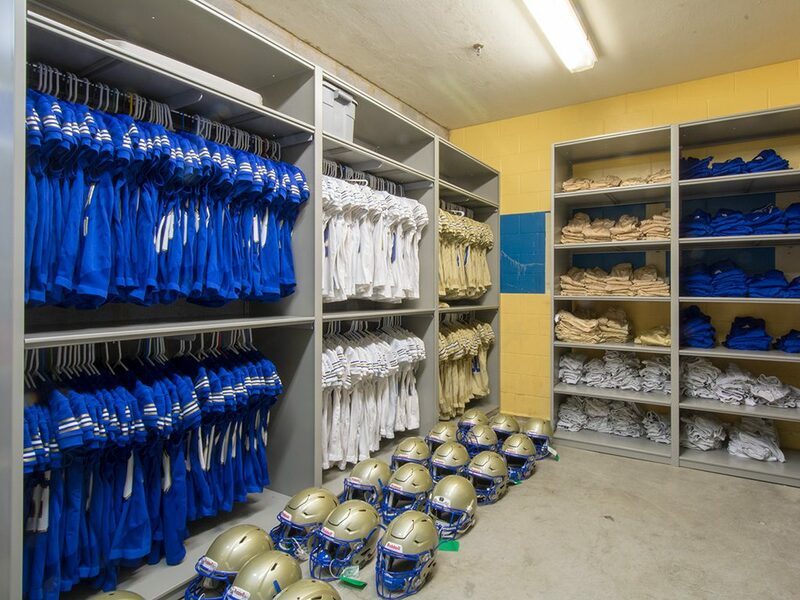 Brentwood High School has two distinct areas that store football equipment. Most of the loose items (helmets, balls, etc.) and uniforms are kept in a room known as “the cloth room.” There is also a room specifically for shoulder pad storage. Evans distinctly remembers when it occurred to him to think about upgrading the shelving and storage in both rooms. 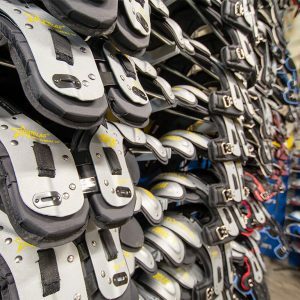 In the shoulder pad room, pads were being stacked 20 or 30 high on seven makeshift units constructed out of PVC piping. While it, too, served its purpose, the constant compression caused bending, cracking and breakage. 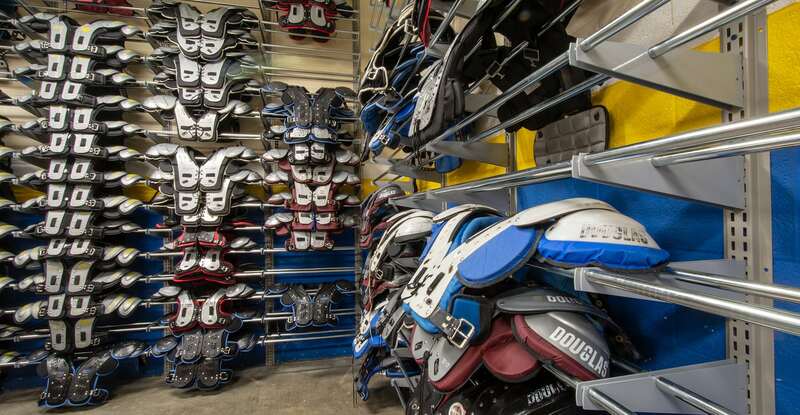 Considering that football shoulder pads can cost between $250 and $450 a pair, coaches and equipment managers like Evans understandably want as long a life as possible out of their gear. As the individual charged with maintaining the Bruins’ equipment, Evans went online to research some available storage upgrade options. That’s when he found several pictures of previous installs done by Patterson Pope for football programs at the high school level, college level and among the professional ranks. He was put in touch with sales representative Paul Myers, and the game plan went into motion. In the Cloth Room, 12 feet of static four-post shelving with Oblique garment rods were added to one wall. It is comprised of a trio of 48” W x 24” D units. On an adjacent wall, a pair of 36” W x 24” D four-post shelving now accommodates pants for all three Brentwood squads. In the shoulder pad room, a combination of wall-hung cantilever shelving and Oblique shoulder pad storage has not only created more organization, but it’s added a highlighted focal point for visitors, as well. 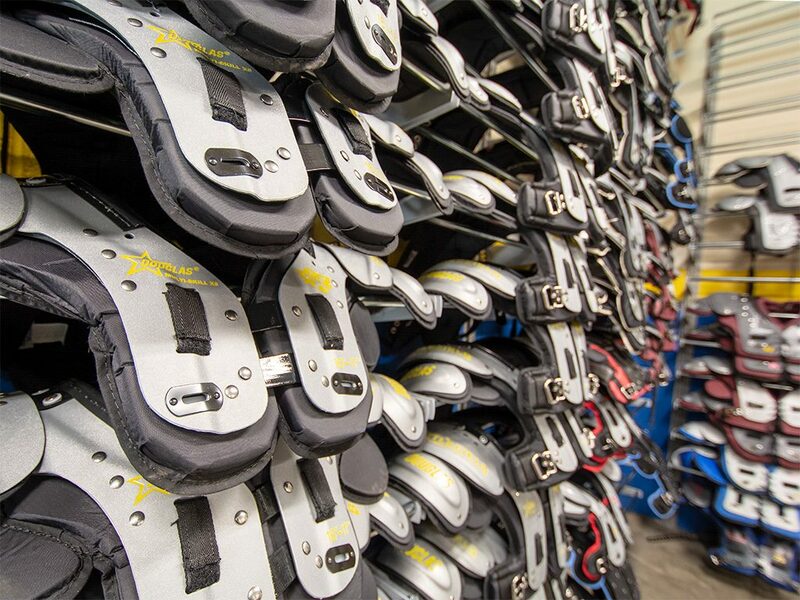 In an area measuring nearly 200 square feet, Evans can now store shoulder pads seven or eight high, each pair resting on its own support structure. Now, the only damage to the pads comes from on-field contact between players – as it should be. Nothing worth doing is ever achieved without the proper support. 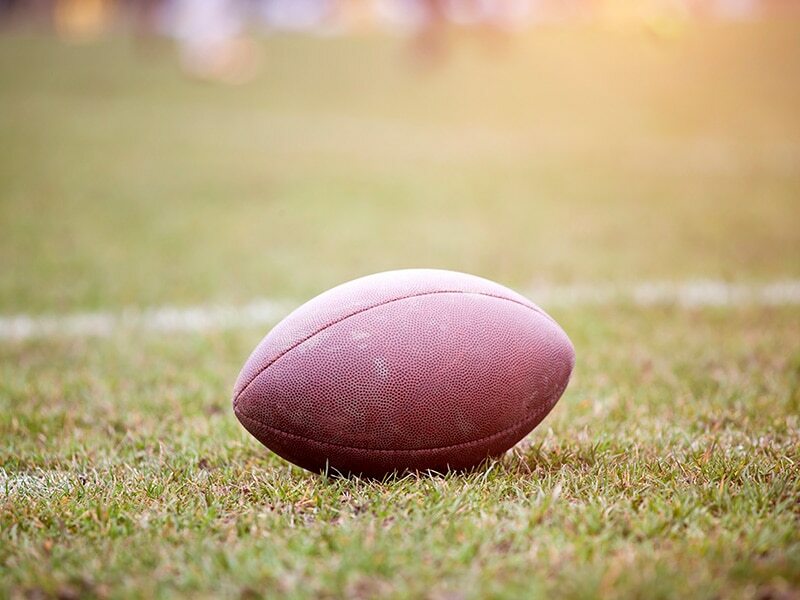 At Brentwood High School, that support comes in the guise of The 12th Man Club, a booster club comprised of school parents who are always eager to show their support – in spirit and financially – for the school’s athletic endeavors. Decals bearing the 12th Man’s logo are affixed to the shelving. Evans said the visuals are constant acknowledgements of the boosters’ support. With that simple reminder, Bruins athletes get to reap the benefits of their generosity and commitment every single day. 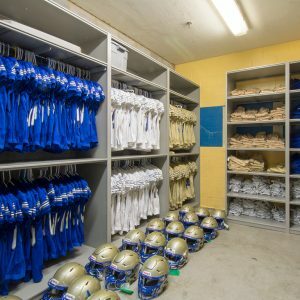 For Gabriel Evans, the new look of the football equipment storage areas are a physical embodiment of his commitment to doing his best for his team – his kids. As a teacher, he enjoys setting a good example. As for the process itself? Easier, perhaps, than some of Evans’s tests he gives as a U.S. History teacher. Thanks, Coach. Anything for the team. For more information on this project, check out our Case Study.